Hermann is the second oldest German Teddy Bear Company. In the year 1912 Bernhard Hermann founded his family business, producing Teddy Bears and Dolls, in Sonneberg. He originally named the business after his initials "BE HA" In 1948 he along with his sons moved his business to Hirschaid near Bamberg where it still is today. The company name was changed to Teddy-Plüschspielwarenfabrik Gebr. Hermann KG. it was in Hirschaid that the father and his three sons rose to become one of the foremost producers of exceptional quality products in the Industry. Today the Teddy-Hermann GmbH, is directed by Bernhards Granddaughters Margit Drolshagen and Marion Mehling. 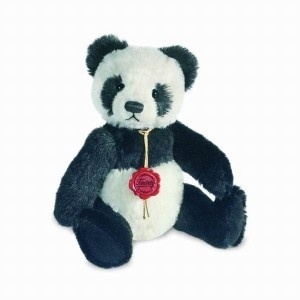 Traudel Mischner-Hermann is in charge of the design and quality of the collectors bears made in Germany. The quality is second to none. Exquisite plush animals and Bears join the Collectible Mohair range with the same attention to detail in their design. Only the highest quality plush is used. Each item is held to the highest standard of manufacture.